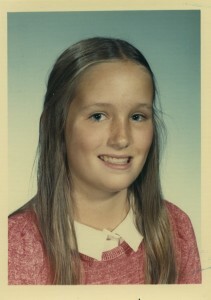 Mrs. Timmer, who taught fourth grade at Blythe Park Elementary School in Riverside back in the seventies, had a way of speaking to nine and ten year-olds in a way that was never condescending, unlike some teachers, whose names will not be revealed. She was never cross, she never shouted. She held thoughtful class discussions, offered up exotic photo clippings from National Geographic as writing prompts, and in springtime she set up a “milliner’s shop” for the girls in the workroom adjacent to our classroom. (I have no memory of what the boys were doing at this time, but I’m sure it was something equally fantastic.) 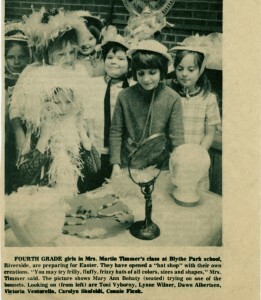 Crafting outrageous hats from paper plates, ribbons, feathers, and lace was one of the highlights of my grade school career. Mrs. Timmer brilliantly nurtured the inherent creativity in her students, and she cheered those first feeble attempts at essay writing while still correcting our grammar and spelling mistakes with aplomb. I wish I could tell her that her confidence in me was not misplaced, that I kept on writing and became a novelist. Once Mrs. Timmer charged her fourth graders the task of creating a Thanksgiving themed-play. She enforced no killjoy guidelines but only asked that the narrative pertain to the holiday, and we were allowed to form our own groups. Predictably, the boys separated into one group and the girls into another. Within the semi-chaos of the bubbly, chatty group of girls, it soon became clear to me that I would not be able to realize my artistic vision. If I wanted to write a play “my way,” I’d have to break away and go independent. The problem with this plan was that unless I wanted to do a one-girl show, I needed a few converts. But my classmates seemed to like being part of the big group and had no interest in my small, indie production. Only Toni Vyborny, who I will always remember for this kindness, decided to join me. Toni and I eventually performed the play, which may have featured the legendary Pocahontas, before the class and our parents. I don’t recall that our little play was remarkable in any way, but I do know that it taught me an important lesson about striking out on your own. Others may or may not like what you’re doing and you might feel a little lonely, but you’ve had the satisfaction of having expressed yourself. This attitude, which incorporates a degree of obstinacy and inability to work effectively in a group, serves a writer well. Like other fiction writers I’ve talked to, I derive satisfaction from manipulating imaginary friends in a reality of my own making, and I have the capacity to do so for incredibly long periods of time. I recognize that people who can work well in groups are perhaps more useful, as a whole, to society than stubborn individualists, but the world needs both types of people. Mrs. Timmer praised Toni and me for persevering with our own play, and she praised the rest of the fourth grade girls and boys for their performances, too. As my second novel, Alchemy’s Daughter, nears release, I’ve occasionally been asked why I’ve gone the independent publishing route via Lake Street Press. The answer is easy: because I got to do it my way, and Kirkus Reviews liked it pretty well, nonetheless. Going indie means doing a lot of the work yourself, but it also means you have a say in your book cover, the editing process, and even your book’s shelf-life. On the other hand, small presses such as Lake Street don’t have the huge publicity machines and extensive distribution networks enjoyed by the large publishing houses. Writers who publish with small presses or on their own have to work harder at tasks other than writing, but they also have more control over the destiny of their work. This entry was posted in Uncategorized and tagged Alchemy's Daughter, Blythe Park, childhood, creative process, individualist, Riverside IL, writing fiction. Bookmark the permalink.